Is there a more beautiful and perfect setting for a celebration than the beach? The sun is shining, the waves are gently crashing, and the atmosphere is oh so heavenly. Plan your upcoming party with our beautiful Beach Theme Mod Party Kit! This comprehensive and modern kit will save you the money of hiring a party planner and the stress of decorating. This custom kit contains all the beachy accessories you could ever dream of! From shading palm tress to swimming seahorses and shells, we have the entire ocean in one little kit! Beach designs are printed on each item to create a beautifully coordinated themed party. All your guests need is a little sunblock! This one stop shop package includes everything from elegant cupcake toppers to classy water bottle labels, making your party planning a snap! 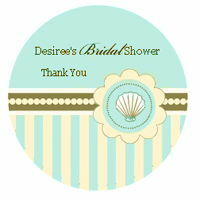 Just add your own goodies and favors and your preparation is done! You can further customize your event (for an additional charge) with our coordinating 2" round personalized labels perfect for decorating any leftover party essentials! Simply add your name, date and/or personal message to bring the shore to you front door! * The kit itself is not personalized. As mentioned above, personalized labels for the kit are available for an additional charge, for a sample image of the label, click here.